Technical death metal is truly a niche sub-genre. Not everyone can weather the onslaught of blistering riffs and unrelenting beats that define the style. Those who can are often very critical listeners, able to dissect and identify subtle nuances and trends that - for the rest of us, anyway - are blurred by the outright brutality of the music. Montreal's Derelict is a band whose somewhat unorthodox style of injecting traces of melody into their tech death style has caught the attention of discerning fans since emerging onto the scene with their 2009 debut album Unspoken Words. An EP and several high-profile tours later, the band is back with their second full-length release Perpetuation. The album exists as a precarious rope bridge strung across the chasm that seperates ferocity and acessibility. With an almost reluctant attempt to push the formidable tech death boundaries, Perpetuation extends a welcoming hand to metal fans who would otherwise steer clear of the style, while at the same time posing no risk of disenfranchising Derelict's fanbase. Perpetuation is dominated by a fairly typical tech death style comprised of trebly riffs, irregular song structures, impossibly fast blastbeats, and throat-shredding vocals that fluctuate between hellish shrieks and raging growls. Derelict bolsters this signature sound by placing an uncommon emphasis on perceptible bass lines and short bursts of six-string noodling. That's right, you can actually hear Sébastien Pittet's four-string serenade rise to the surface of the mix and share the spotlight with Max Lussier's fretboard antics. 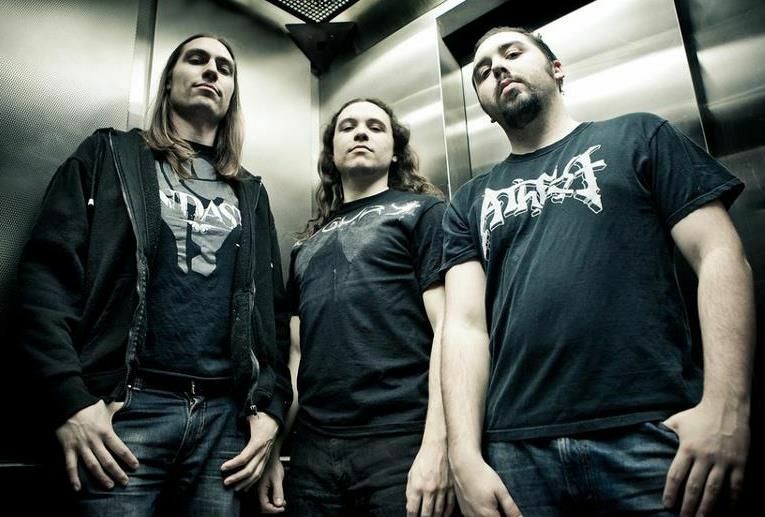 Songs such as "Olympic", the title track, and "Recreated" fit squarely in the realm of Derelict's chosen market, and offer the purest attraction for fans of undiluted technical death metal. 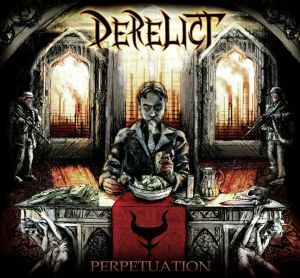 Based upon their history and many of the songs on Perpetuation, Derelict's goal is not to paint themselves into a stylistic corner but to reach across the aisle, so to speak, in an attempt to marry brutality with melody. It may take a determined listen to perceive all of the ways in which the band strives to achieve this goal, but once detected the nuances present an interesting experience. "Spoils Of War" is a song that opens with a blatantly classic metal lead, and at several points during the course of its runtime Lussier delivers riffs with a grinding, thrashy touch. "Digital Birthright" also sports some mosh-inducing riff action, while "Expiry" has obvious power metal undertones and a nicely executed solo. All of the tracks on Perpetuation boast soloing to one degree or another, though those on "Intricate Decay" and "Digital Birthright" showcase Lussier at his most soulful. One of the criticisms leveled against the tech death style is an overall lack of variation from song to song. On Perpetuation, Derelict defeats auditory numbness through unusual (for the style) guitar heroics and Eric Burnet's tireless vocal performance. There's a common sound that binds the album together, of course, and picking up on the subtleties takes some work, but Perpetuation is an album that will find traction among tech death and extreme - but not so brutal - metal fans alike.